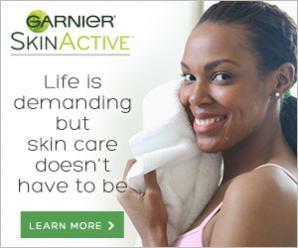 Garnier believes that beauty happens when people look healthy and feel happy. Clearly Brighter Brightening & Smoothing Daily Moisturizer SPF 15- A clinically proven daily moisturizer with Antioxidant Vitamin C that works quickly and effectively to even out tone and texture for visibly brighter, smoother skin in just 1 week. Micellar Cleansing Water – an All-in-1 cleanser that effectively removes makeup, cleanses, and refreshes skin in one simple step without harsh rinsing or rubbing. Check out our bloggers experience with these two incredible Garnier SkinActive Products and leave a comment for the chance win a $100 Gift Card! The Beautiful Skin Active Sweepstakes on BlogHer runs from 09/26/2016 through 10/22/16 and is only open to individuals who, at the time of entry deadline, are legal residents of the United States and are 18 years or older. Click “here” to read the official rules. Winners will be randomly selected from all eligible entries. Good luck! 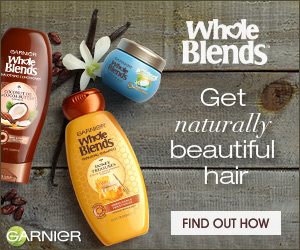 Read our bloggers posts that celebrate the Garnier Whole Blends line. Plus get a chance to win $100 from four sweepstakes! Naturally Inspired Hair Care Sweepstakes on BlogHer runs from 5/2/2016 through 5/10/2016 and is only open to individuals who, at the time of entry deadline, are legal residents of the United States and are 18 years or older. Click “here” to read the official rules. Winners will be randomly selected from all eligible entries. Naturally Inspired Hair Care Sweepstakes Part 2 on BlogHer runs from 5/4/2016 through 5/31/2016 and is only open to individuals who, at the time of entry deadline, are legal residents of the United States and are 18 years or older. Click “here” to read the official rules. Winners will be randomly selected from all eligible entries. Naturally Inspired Hair Care Sweepstakes part 3 on BlogHer runs from 8/1/2016 through 9/1/2016 and is only open to individuals who, at the time of entry deadline, are legal residents of the United States and are 18 years or older. Click “here” to read the official rules. Winners will be randomly selected from all eligible entries. Naturally Inspired Hair Care Sweepstakes part 4 on BlogHer runs from 11/16/2016 through 12/31/2016 and is only open to individuals who, at the time of entry deadline, are legal residents of the United States and are 18 years or older. Click “here” to read the official rules. Winners will be randomly selected from all eligible entries.